Boost your email marketing efficiency by partitioning your recipient lists into groups, which will automatically update. With ActiveTrail you can divide your recipients into different groups that share characteristics such as age, residence, professional status, email provider, etc. and direct specific content to specific groups of recipients. The system even allows you to choose that every new recipient added will be automatically sorted to the group that best fits his/her characteristics. All you have to do is click on “Contacts” in the top menu of the system and then on “Dynamic groups”. 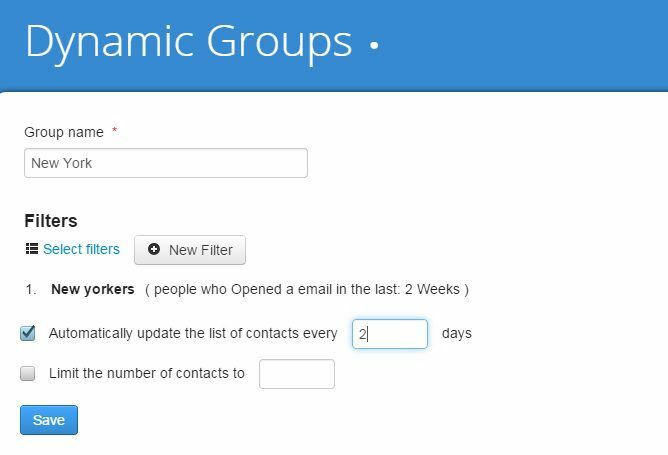 Follow the system’s instructions to set up your filter: provide a name for your dynamic group and add filters based on your criteria. To automatically add new recipients who fit the criteria to the dynamic group select “Automatically update the list of cpntacts” and set a time frame. Create as many groups as you like, based on your marketing needs, and boost your campaign’s effectiveness to new levels. An excellent example as to the convenience of filters can be seen in educational institutions. Colleges, for example, can divide their recipients by programs, courses, years, etc., and thus avoid sending irrelevant messages to all students. Don’t believe it’s that easy? Try it out for yourself! Join ActiveTrail and create dynamic groups to provide the best service for your clients.